In response to Red's "seriously?" post I pulled out a blade and headed out in the backyard for a couple of photos. This is a Redneck kit that I did last year. I'm not positive but I think it was Red's first kit sale on his previous forum. It is 1/8" 1095 steel with stabilized dyed box elder scales, black liners, and stainless hardware. 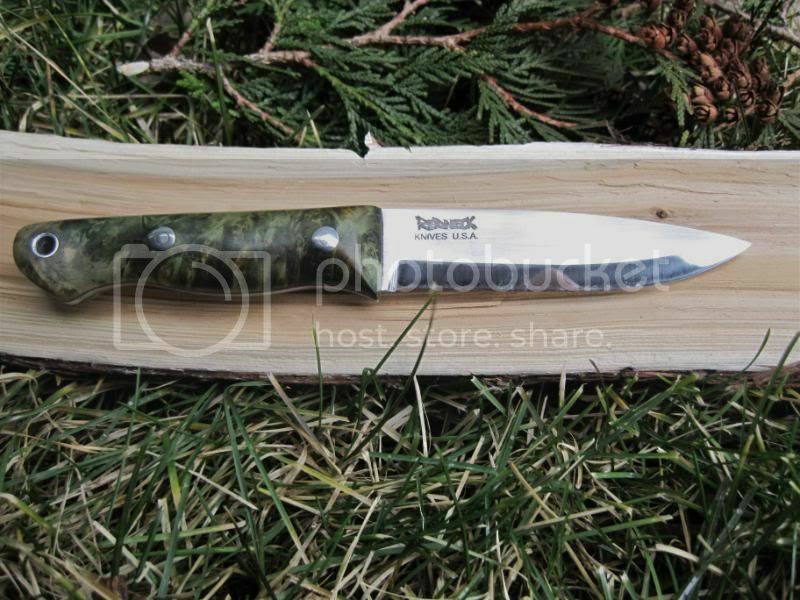 This was the first high-quality knife blade that I handled. I made a dangler sheath from 8-9 oz veg tanned leather and concocted an olive green dye from various colors of oil dye I had on hand. 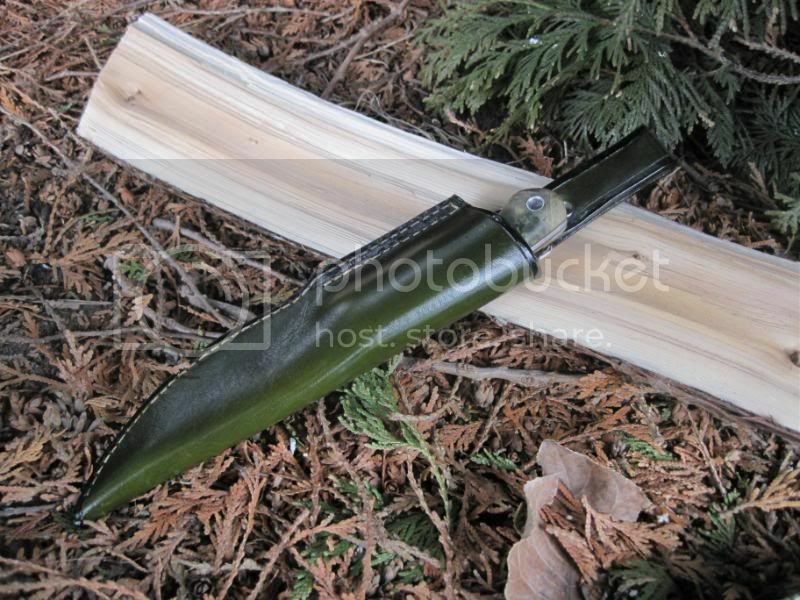 The sheath was finished with Super Sheen and the black edges and whatnot are Edge Kote. Not my best sheath, but serviceable, and certainly one of a kind. 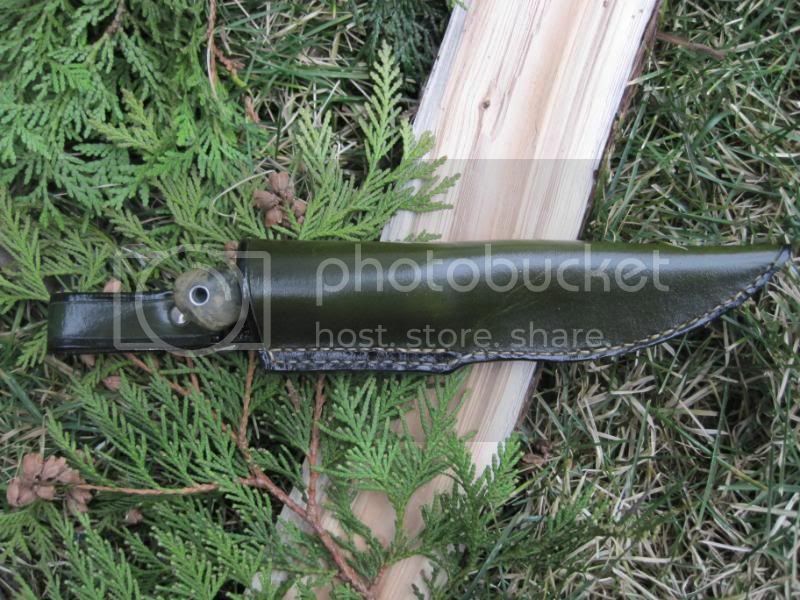 The only problem with the knife and sheath is that if I set them down when I'm out in the field they virtually disappear in the foliage/grass/leaves! Try to ignore the schmutz on the blade... 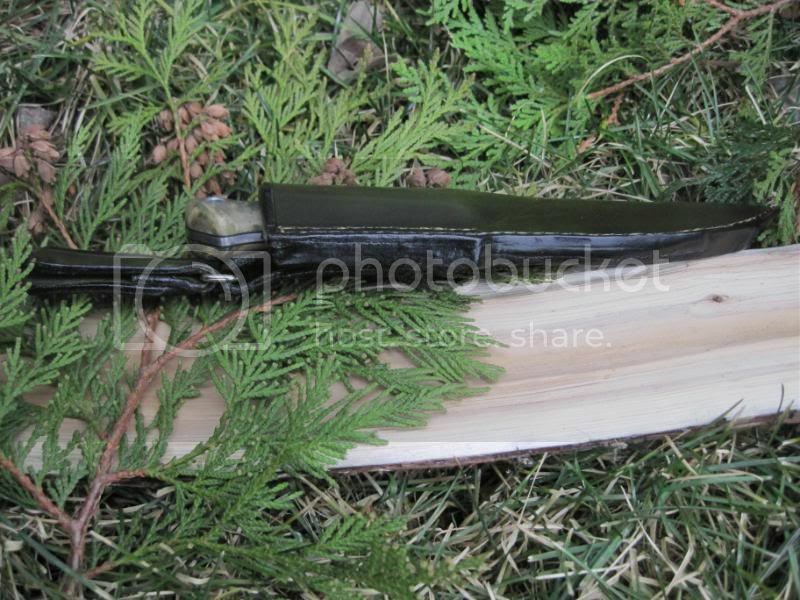 I was just hacking some cedar with it in the backyard and there is some sap on the blade. Good stuff, Gurthy! 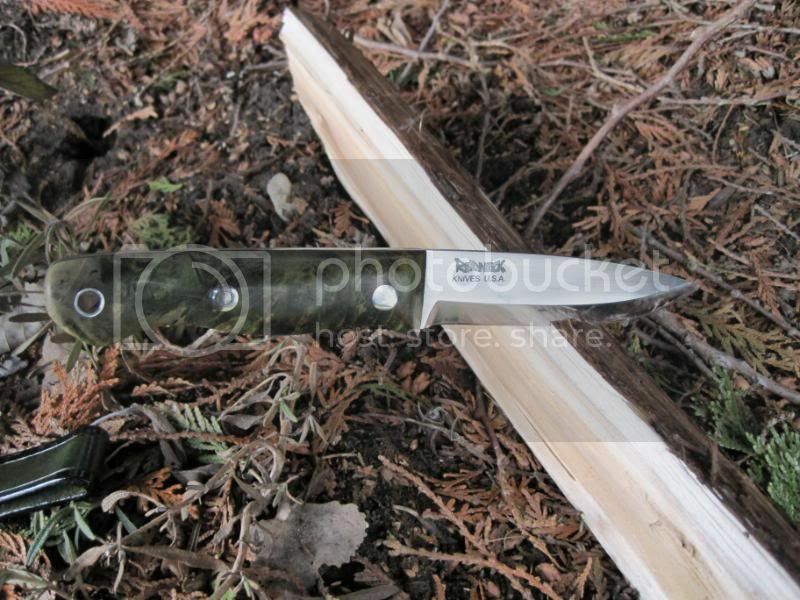 I really like the sheath color - it's a great match for the handle. I hear you on the color being easy to disappear against the natural surroundings. I could really use brighter colored handles to save me time searching, but I just can't stand having glowing knives. 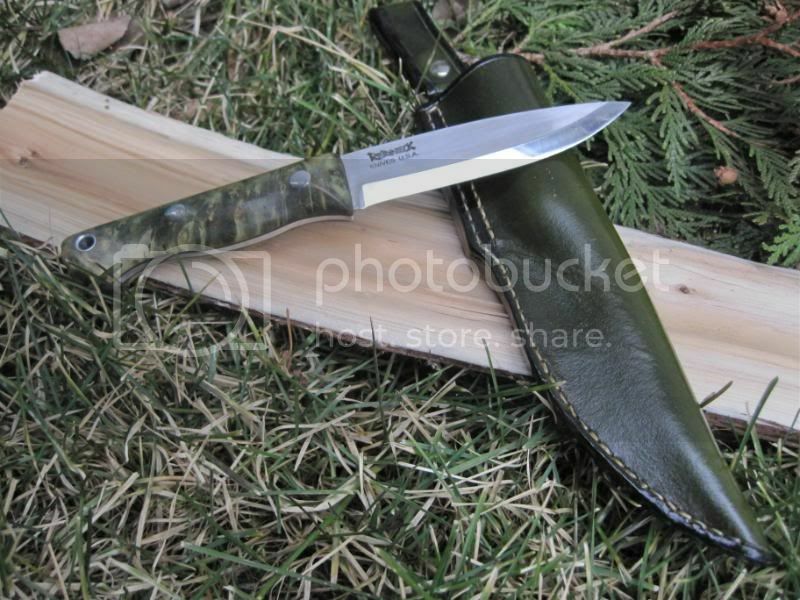 Yeah that's slick - love the matching sheath! Yep, Red always has some awesome scales. That's a nice color combo. You could just put a bright lanyard on it if you're worried about it blending in. Great looking combo you have there. I am digging them scales. Is that the Koster kit? You did a great job on that Gurthy!! I agree, I'd have to put a short hank of orange paracord or something on that or I'd lose it for sure!! Very nice! I would hate to use something that nice looking. Sure is a beautiful set up! Thanks for he kind word guys! Yes, it is the Koster kit, and yes I do find it difficult to use because the scales are beautiful and the edge is polished like a mirror... I'd feel guilty messing it up LOL! You'll wind up doing what I do, getting another one to beat on so your favorite ones stay nice! Man that is nice. Green is my favorite color so I would love to get one with those scales.